Tempt hungry diners with pictures and video of tasty new dishes. Generate more frequent customer visits with email coupons. Establish yourself in the neighborhood with newsletters that feature delicious recipes and gastronomical expertise. Our Drag and Drop Email Editor lets you cook up professional, content-rich messages in less time than it takes to boil an egg. Online Survey can be your secret shopper. It's easy to craft a great looking questionnaire that helps improve the customer experience. Email Tracking makes it easy to visually measure the success of your campaigns and make adjustments accordingly. 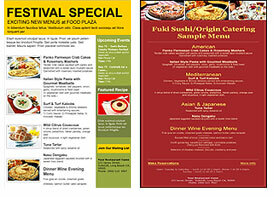 Email Marketing Manual for restaurants. Download the free PDF or read it directly from our website today! Benchmark has over 300 mouth-watering newsletter templates to choose from. If you're serving up high quality, Benchmark has a design for you. Benchmark Email makes it easy for you to organize your email marketing campaign by taking the guesswork out of the process. Are you ready to create an memorable newsletter for your customers in less than 10 minutes?